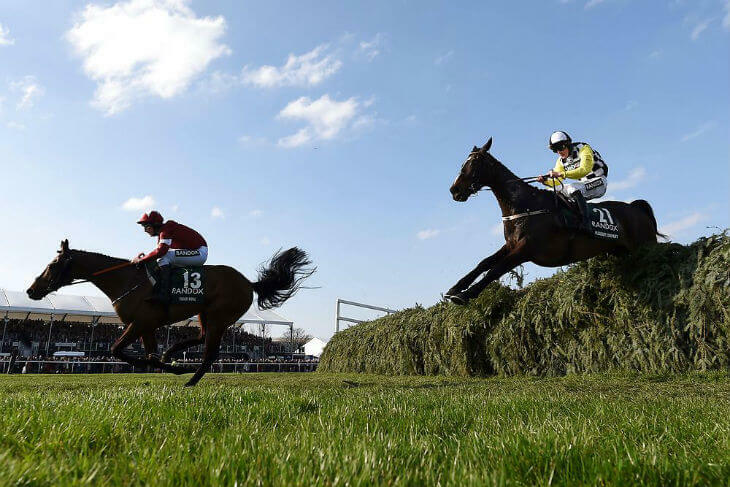 UPDATED Grand National Runners : Top weight MINELLA ROCCO, Vicente and Beeves have been withdrawn from the 5:15pm Aintree Grand National 2018. Trainer, Jonjo O’Neill said the 5mm downpour over Aintree this morning was enough to make the going too soft for last year’s Cheltenham runner up. This means the Mouse Morris trained THUNDER AND ROSES, ridden by JJ Selvin will take Minella Rocco’s place. Beeves and Vicente have also been withdrawn and replaced by Walk In the Mill and Delusionsofgrandeur respectively. These horses will be ridden by Sam Waley-Cohen and Henry Brooke. Minella Rocco’s exit from the race has meant that each of the 40 runners will now be carrying one extra lb each with Blaklion taking the top weight at 11-10. The wait is finally over as we’ve now got the final 40 (+ 4 reserves) Grand National runners that have made it into the 2018 Randox Health Grand National. The JP McManus-owned MINELLA ROCCO heads the weights with 11-10 as this 8 year-old looks to become the first horse since Red Rum (1974) to win with more than 11-9 on his back. The horse will be ridden by Noel Fehily, who is yet to win the Grand National, but is trained by Jonjo O’Neill, who won the race in 2010 with these famous green and gold colours when Don’t Push It came home first that year. Last year’s fourth – Blaklion – is next best in the weights with 11-9 to carry – that will be 8lbs more than he had last year but he’s already won over these fences this season when taking the Becher Chase back in December. This 9 year-old will be popular in the betting at around 10/1* and has also had a recent wind operation to help his breathing. Sam Twiston-Davies rides for his trainer father Nigel. Recent Cheltenham Gold Cup third – Anibale Fly – is next in at the weights with 11-7 – the same as the 2016 runner-up The Last Samuri – these are around 10/1* and 16/1* in the market. After the final declaration stage for the Grand National Runners, the main absentee is the Nicky Henderson-trained Gold Present. This means the Seven Barrows yard, who have never won the Grand National, won’t have a runner this year. His defection has meant that the Noel Meade-trained Road To Riches gets into the race as number 40 – he’ll have just 10-4 to carry and will be ridden by Sean Flanagan, plus represents the Gigginstown Stud owners that won this race in 2016 with Rule The World. We do also have four reserve runners in the race in case anything happens to the main 40 between now and race time (5:15pm Sat 14th April) – these are Thunder And Roses, Delsionofgrandeur, Walk In The Mill and Vintage Clouds. The betting remains relatively unchanged with Blakion, Total Recall, Tiger Roll & Anibale Fly all figuring prominently at the head of the market – depending on who you bet with they are all around the 10/1* mark and at this stage it’s hard to know which one will go of as the 2018 Grand National favourite. With the ‘once-a-year’ punters sure to remember last year’s fourth – Blaklion – then there is every chance this 9 year-old will gain support nearer the race, while the same can be said for The Last Samuri, who has been another popular runner in this race in recent years. We’ve also three female riders in the race this year as Rachael Blackmore (Alpha Des Obeaux), Katie Walsh (Baie Des Iles) and Byrony Frost (Milansbar) will be looking to become the first winning female rider of the Grand National – the race always seems to throw-up a story, so could this be it this year!? Has your Grand National Runners pick made it?